Guernsey player-coach Andy Whalley says his team are confident of winning the EH National Trophy final against Sheffield University Bankers. The Islanders are the current holders and have reached the final for the fourth year running. "We go into this one probably feeling more confident than last time," Whalley told BBC Radio Guernsey. "We're a bit like the Manchester United of old - even when we're not playing well we still grind out a result." 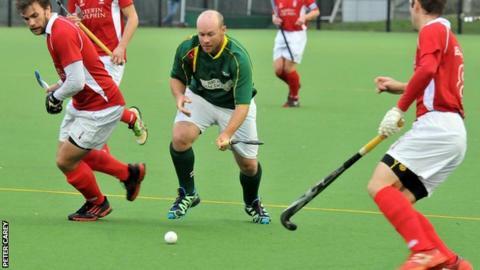 Guernsey beat Didsbury Northern 2-0 in the last four to reach the final, which is being held at the London 2012 Olympic hockey venue. They have named a 16-man squad, with former captain Matt Watson their only absentee. "There are a couple of little niggles, but we've rested them over the last couple weeks, so I'm pretty sure those guys will be fine," said Whalley. "We're playing against a very young Sheffield side - they're all students so they're going to be young, fit and quite confident in their own abilities." The islanders last lost a Trophy game in 2013, when they were beaten 3-2 by Lewes in the final.